Now as much part of our Christmases as Her Majesty’s Address to the Commonwealth – but much more amusing and a good deal more edifying – A Christmas Carol appears in this new edition alongside four other seasonal books by Dickens: The Chimes – A Goblin Story, The Cricket on the Hearth – A Fairy Tale of Home, The Battle of Life – A Love Story, and The Haunted Man and The Ghost’s Bargain – A Fancy for Christmas Time. Since its first publication, just before Christmas 1843, Dickens’ ‘ghostly little book’ – A Christmas Carol – has never been out of print. William Makepeace Thackeray hailed it as a ‘national benefit’, and warned off critics from ‘reviewing it down.’ He even claimed that it had caused the gloomy Sage of Chelsea, Mr Carlyle – a man who ‘did not keep Christmas Day’ – on reading it ‘to send out for a turkey and to ask two friends to dine.’ What took Dickens only six weeks to write created a new genre in the Christmas story and is regarded by most Dickens readers and scholars as a masterpiece. Nor do all scholars regard the genius of Dickens to have been suited to short stories. 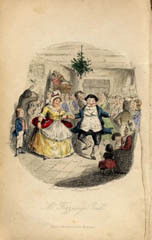 Of the Christmas Books, the critic Steven Marcus has written, ‘only A Christmas Carol is of genuine literary interest.’ Where the writing of literary history is concerned, this probably is the case, but it somewhat misses the point: these seasonal productions of Dickens’ were hugely anticipated by his readers and they continue to be greatly enjoyed by new generations of readers. Their appeal, like Christmas, is timeless. Robert Douglas-Fairhurst’s lively introduction provides historical background information about the inspiration of these Christmas stories, how they were composed, and how they were received by the reading public.